Does your car, truck or motorcycle need to be towed to or from San Rafael? Newway Towing’s long distance towing services are ideal for transporting your vehicle safely and securely. It’s easy to arrange and simple to set up, with exceptional customer service from the moment you call us. This is the perfect solution to relocate your vehicle into or out of San Rafael. Just pick up the phone and get in touch! Newway Towing provides long distance towing services to or from San Rafael -through an affiliate network of independent tow truck operators. Our team is available round the clock. Morning or noon, night or day, weekday or weekend: trust us to provide outstanding towing service exactly when you need it. We’re here to take your call and arrange your long distance towing 24 hours a day, 7 days a week, 365 days a year. You can reach us for a quote and to book your vehicle’s transportation when it suits you best — no waiting around for our office to open, no searching for our business hours. Just great service from a dedicated team. 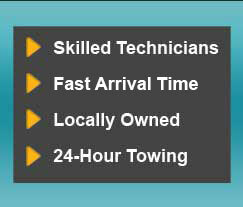 Newway Towing’s team of licensed technicians are all highly-trained and experienced. They deliver exceptional service in every long distance towing case and use the latest equipment to ensure your vehicle stays secure during the transportation process. Our tow trucks are maintained on a regular basis to perform to the highest standard. We invest in the latest equipment to ensure all our technicians have all the tools they need to keep your car, motorcycle or any other vehicle safe on the road. Flatbed towing is available for maximized protection from debris and other vehicles, but all of our tow trucks offer exceptional carriage. We have a big fleet of trucks in operation, so finding one to handle your long distance towing into and out of San Rafael is quick and easy. We care about keeping our costs as competitive as we possibly can. Our rates are affordable for drivers on all budgets, even on long distance towing: this is essential to cater to everyone in San Rafael’s community. When you call us, we’ll offer a quote for the job and this is what you’ll pay. Unlike some other towing companies, we don’t believe in hidden charges or extra fees you don’t know about until the last minute. We’re ethical, dedicated and proud to have a great reputation in our community. Newway Towing’s team is passionate about our reputation for excellence. Customer satisfaction means a lot to us: we want you to feel reassured that our long distance towing service is the right choice. Your vehicle will get exactly where it needs to be in the condition you expect — no ifs, ands or buts. Our qualified technicians know San Rafael and its surrounding areas brilliantly and follow the most efficient, time-saving routes for fast delivery. Looking for more details on our long distance towing services? Want to ask about our pricing? Just call us on (415) 870-3377 and we’ll be happy to help!